Dorset’s filter system for reusing dust water is now in action at the recently opened poultry house “De Mispelhoeve”. The filter system ensures further optimization of Vencomatic ECO Units. The ECO unit is a system that ensures climate control in the poultry house and at the same time filters out fine dust and ammonia. The Dorset filter system filters the solid from the dust water of 3 ECO Units. This allows the water to be reused for dust cleaning and thus keep the ECO Units climate control optimal and reduce water consumption. The new De Mispelhoeve poultry house is a “Better Life” poultry house for Freiland chickens. This house has three rows of Bolegg Terrace system with the Q-Perch perch and has many other modernity’s. The complete ventilation is controlled by three ECO Units that reduce ammonia and keep fine dust to a minimum. The ECO unit is a Vencomatic system that ensures climate control in the poultry house and at the same time filters out fine dust and ammonia. These climate systems are a further development of the existing heat exchangers. In addition, the unit is equipped with a fully automatic cleaning system. Dust impedes the functioning of heat exchangers. In the case of heat exchangers, conductivity is of great importance and material-guided heat is considerably worse if there is a layer of dust on it. 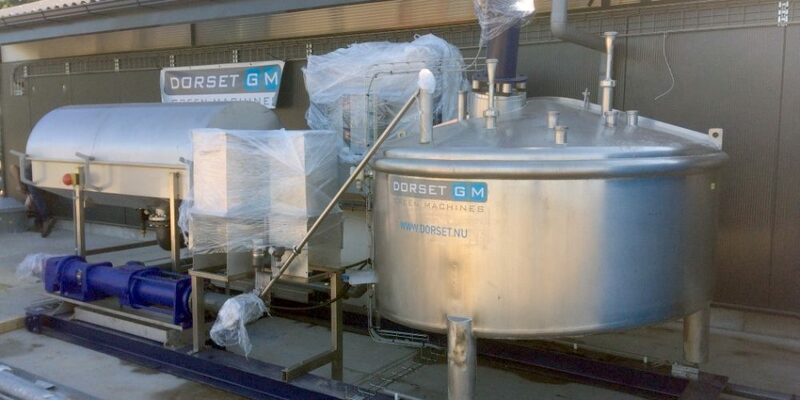 The water from this cleaning system can be reused after being processed by Dorset’s dust water filter. In order for the heat exchangers to perform optimally, the dust is cleaned off. Cleaning with impure water, however, leads to sub-optimal performance. That is why Dorset worked together with Vencomatic on trying to create a simple solution. The dust captured in the ECO units of Vencomatic ends up in water. This water can be reused by filtering out the solid parts with the aid of biological flocculant. This system can also be used for other applications where water needs to be filtered, such as process water from air scrubbers or dust scrubbers. We congratulate the Verbeek family with the new De Mispelhoeve poultry house!